REPUBLICAN SENATOR SUSAN Collins of Maine has declared that she will vote to confirm Brett Kavanaugh’s Supreme Court nomination, all but ensuring that a deeply divided Senate will elevate the conservative judge to the nation’s highest court despite allegations that he sexually assaulted women decades ago. The dramatic Senate floor announcement by perhaps the chamber’s most moderate Republican ended the suspense over a battle that had left Kavanaugh’s fate in doubt for nearly a month after the first accusation against him. It assured a victory for President Donald Trump’s quest to move the Supreme Court to the right, perhaps for decades, and a satisfying win for Senate Majority Leader Mitch McConnell and the GOP’s conservative base. Moments after Collins finished talking, the only remaining undeclared lawmaker, Democrat Joe Manchin of West Virginia, said he, too, would vote yes in the showdown confirmation roll call expected tomorrow afternoon. Manchin, the only Democrat supporting Kavanaugh, faces a competitive re-election race next month in a state Trump carried in 2016 by 42 percentage points. Support by Collins and Manchin gives Kavanaugh at least 51 votes in the 100-member Senate for an election-season victory against the backdrop conflict of the #MeToo movement and staunch conservative support for Trump. Both parties are hoping the bitter struggle will energise their most loyal voters to stream to the polls in less than five weeks, when GOP control of the House and perhaps the Senate is in play. Collins said Dr Christine Blasey Ford’s powerful testimony to the Senate Judiciary Committee last week describing Kavanaugh’s alleged 1982 assault on her was “sincere, painful and compelling”. But Collins said witnesses Ford had identified who were interviewed by the FBI last week and included in a report the agency gave lawmakers had failed to corroborate Ford’s claims. My heart goes out to anyone who has experienced any type of sexual assault in their life. However, based on all of the information I have available to me, including the recently completed FBI report, I have found Judge Kavanaugh to be a qualified jurist who will follow the Constitution and determine cases based on the legal findings before him. Republican Lisa Murkowski of Alaska, a fellow moderate and a friend of Collins, is the only Republican who has indicated she will vote no. 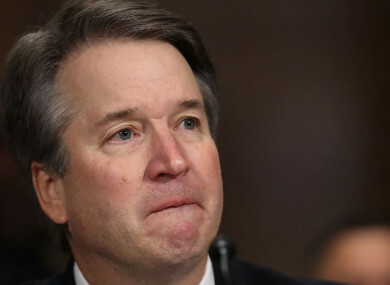 She told reporters today that Kavanaugh is “a good man” but maybe “not the right man for the court at this time”. Earlier the Senate today voted 51-49 to limit debate, effectively defeating Democratic efforts to scuttle the nomination with endless delays. With Republicans clinging to a two-vote majority, one Republican voted to stop the nomination, one Democrat to send it further. Republicans said the secret document — which described interviews agents conducted with 10 witnesses — failed to find anyone who could corroborate allegations by his two chief accusers, Blasey Ford and Deborah Ramirez. Democrats belittled the bureau’s findings, saying agents constrained by the White House hadn’t contacted numerous other people with potentially important information. The vote also occurred against a backdrop of smoldering resentment by partisans on both sides. That fury was reflected openly by thousands of anti-Kavanaugh demonstrators who attended the Capitol complex for days, confronting senators in office buildings and even reportedly near their homes. Dianne Feinstein of California, that committee’s top Democrat, said Kavanaugh’s testimony at last week’s dramatic Judiciary panel hearing should “worry us all”, citing “a hostility and belligerence that is unbecoming” of a Supreme Court nominee. Senate Minority Leader Chuck Schumer, a Democrat from New York, called the fight “a sorry epilogue to the brazen theft of Justice Scalia’s seat”. That reflected Democrats’ lasting umbrage over Republicans’ 2016 refusal to even consider Merrick Garland, President Barack Obama’s nominee to replace the late Antonin Scalia. When Trump nominated Kavanaugh in July, Democrats leapt to oppose him, saying that past statements and opinions showed he’d be a threat to the Roe v Wade case that assured the right to abortion. They said he also seemed ready to knock down Obama’s healthcare law and to rule for Trump if federal authorities probing his 2016 campaign’s connections to Russia initiate legal action. A fuming Kavanaugh strode into the same packed hearing room that afternoon and said he, too, was “100 percent” certain the incident had not occurred. He angrily accused Democrats of a “search and destroy” mission, fuelled by their hatred of Trump. Email “Senators back Brett Kavanaugh, paving way for Supreme Court confirmation”. Feedback on “Senators back Brett Kavanaugh, paving way for Supreme Court confirmation”.